This fundraiser event for Mon Sheong Foundation was an exceptional experience for the younger Chinese generation; particularly since the presentation and overall attendee experience was so different compared with the Dragon Ball (that benefits the Yee Hong Foundation) and the Cathay Ball (that benefits the Mon Sheong Foundation). Many older Chinese adults are very much accustomed to the sit down banquet style dinner that is offered at these Balls. Fete Chinoise is most definitely geared to the more youthful adult as the atmosphere was more relaxed and lounge in feel. 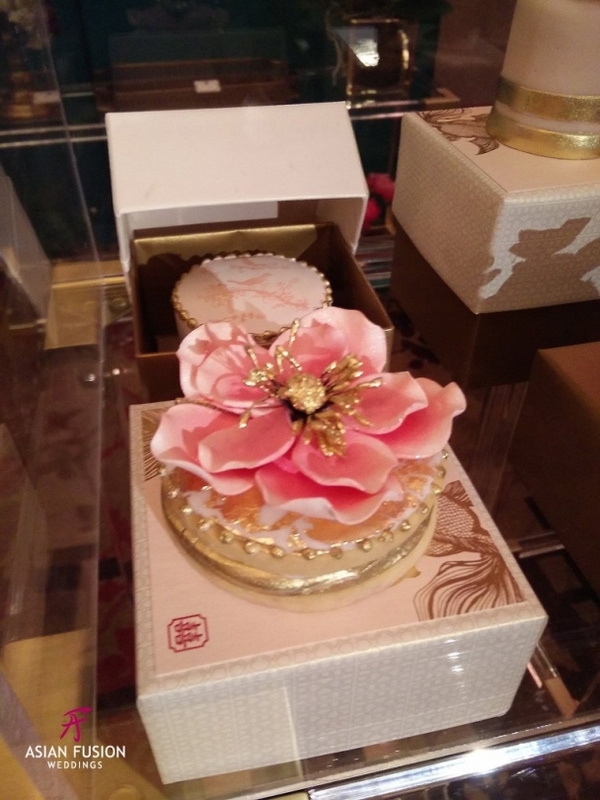 Once we completed looking at the exhibits in the Marketplace area, we toured the adjoining room (Queen’s Park II of the Shangri-la Toronto) entitled “Summer Palace Park”. This area is where we were able taste a sampling of shrimp dumplings, pork dumplings and vegetarian dumplings. We also enjoyed the ambiance while admiring cakes created by Bobette and Belle and wedding invitation suites by Palettera. 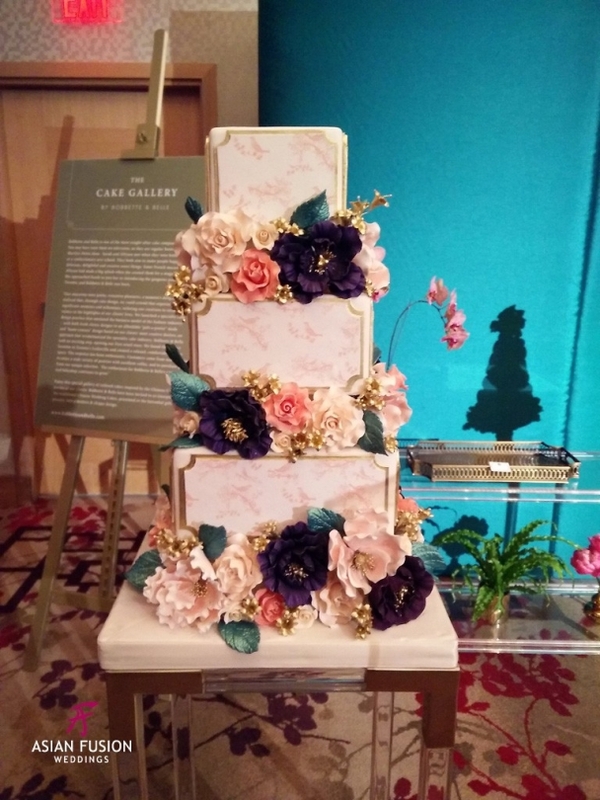 This first cake featured an Asian like chintz or toile pattern on the wedding cake. These next cakes featured geometric patterns that are commonly found in Chinese art. 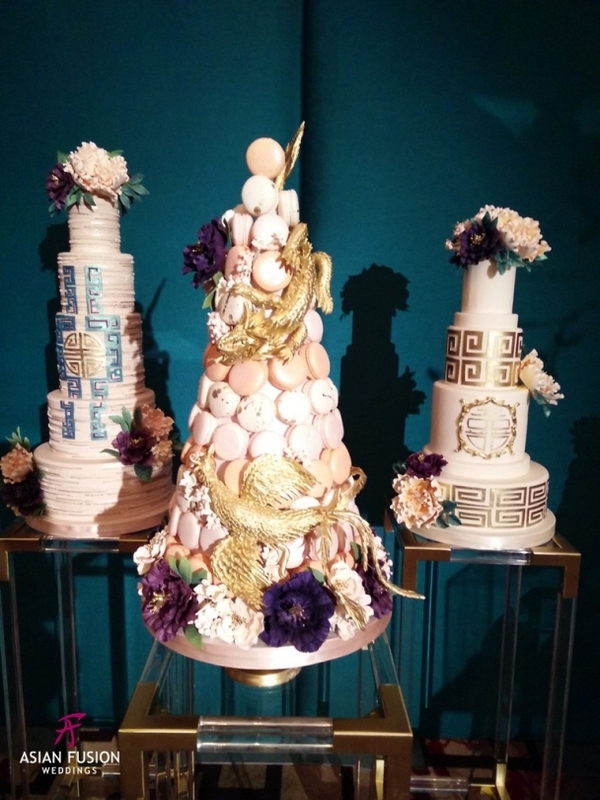 We loved the idea for a macaroon tower with the Phoenix and Dragron intertwined in the design. Palettera is known for their luxury wedding invitation suites. Here are just a couple of pictures of their exquisite work and boundless creative executions. pinthis pinthisOur next stop was the Outdoor Garden Terrace of Shangri-la Toronto. This space was titled the Penjing Porcelain Garden. Here guests sampled hot toddies – which consisted of whiskey, hot spiced tea with a slice of lemon and a cinnamon stick. We also sampled BBQ skewers of beef, pork, chicken, and calamari. All these mouthwatering skewers were really tantalizing to our taste buds!! It was a little chilly on the patio even with the heaters, so we moved back indoors to do some sampling of the teas in the Rosedale Room of the Shangri-la Toronto appropriately title The Tea Room. While we were sampling the tea, Shangri-la’s very own inhouse Tea Sommelier was on hand to educate us on the various teas, their distinctive properties, and their origins. Did you know that you can sample one of the 85 teas that the hotel offers during their high tea? Being Chinese, we might have tried maybe a total of 24 different teas. The number is 85 is just mind boggling. A modern interpretation of a Chinese tea ceremony was also featured in this space. From there we traveled back inside to enjoy watching some wedding videos from Origami Heart, Norris Films, Images and Michael Y. Wong in Shangri-la Toronto’s private theatre which feels like a luxury theatre. If you were able to attend Fete Chinoise this year, please comment below and let us know what you thought about this fundraising experience. Has this experience changed your perspective or impressions on having a Chinese wedding?